I was thinking What is the Compatibility Issue? Why it is so important? and What we do Here? Testing Functionality of the Software on Different Software and Hardware Platforms is called Compatability Testing. Let's look into What that means and what you need to do about it. ➽ What is the Compatibility Issue? In 2015 My friend Linda has bought one gaming Software. And after Purchasing that CD she installs that in her Computer followed by Agreement Page. She clicks on I Agree, Next, Next, Next and Finish. It gives her an Error!! Saying "Sorry Unable to Install the Software". Again She tries to Install OS tries to Run that again but still, Same Error Pops up "Sorry Unable to Install the Software". Now it's very Obvious to get angry that have bought them for $$$, and what she got was Error! Very Disappointing Right! Now she went back to the store, you Started Yelling at the manager! She Told the Manager that when she Tries, Installation Fails. And you have charged me For $$$ dollars for this not working CD. She was very angry With the Manager. manager Reply that I am sorry Madam, let me check that first! And He takes that CD and Follows the steps of Agreement And he was able to Install the Software. He Replies back to Linda Saying " I'm able to install Cd and Cd is properly Working. I Don't Know What is the problem with your PC". The problem here is the Software Developed is noncompatible with her PC. Where She was Try to install that on Mac Operating System Whereas The Gaming Software Developed was only Compatible to Windows. The Developer, In this case, has not developed the software in a way that will work on all the operating systems. To Avoid the Case which happened with Linda, Which can Happen with Anyone out there. Developers Should Develop the software in Such a way that It should be compatible in any Existing OS. This can also happen with Browsers. ➽ why it is so important? ⇛ Compatibility plays a very major Role in Software Development. And the Software Will not Reach to the rest of the World who uses Different OS or browsers That the Developer Worked For. Eventually falls Very bad impact on the brand! Which Means Loss of the Company. That means It has to be compatible with Every Platform. When Every user is Happy, the Company gains Maximum Profit. ➽ What we(Testers) do Here? ⇛ Now For Detailed Knowledge, To Become Tester One Should Know all the details Regarding it. Web Applications: Any application access in Browser is called as Web App. Client/Server Based Applications: Like Whats App, This the Best Example OF Client/Server Application. Stand Alone Applications: Like Ms office where I did not need an internet connection. for example - ms office, VMware, VLC Player etc. 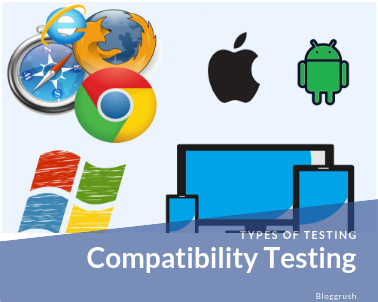 ➽ How to do Compatibility Testing for Web Applications? Chrome that too on Different Versions. FireFox that too on Different Versions, etc. Now to test that in Every browser and their versions. I have to install Every Browser And their Versions. which make my work Hectic. So There is a Tool Which Contains all most all the Browsers, which is available on Google called as Browserstack, Utilu (free) and much more free tools are available. That Saves my time From Installing and uninstalling the Browsers. Summing all, Here we test the functionality of Web applications on Different Browser. This is also called Cross-browser Testing. Images are not Loaded Properly. Change in Colour and Font Size of the Text. Certain Links and Buttons Re not Working. ➽ How to do Compatibility Testing for Client/Server Based Applications? ⇛ Imagine that, I am Testing XYZ application in my PC at Home. In my pc, I divided my hard disk in some OS's now I can test the software on different Operation system. but now when I am testing in Companies can I do the same thing? NO !! If I do so if I partitioned big server in many operating systems and now some of my colleagues are also testing on that server. As I have done testing in by restarting my pc and selecting OS. Here if I restart Server, rest all of the colleagues will face the restart. And like this testing will never happen. I want to do Multiple Operating System without Restarting the Server. So how exactly it is done? Here is the answer, one base Operating system is there for example- windows 10. In that Server, I will install an application called VMware. Inside VMware, I will install #Window 7, Windows 8, Windows 9 & much more Operating System. Here there is no need of Restating the Server for Switching Operating Systems. This Reduce the Testing time by Prevented by Restarting. Here we test the compatibility of client Software on different Operating System. To install Multiple Operating System we use VMware. Because I will Help us to change the Operating System Without Restarting the Server. ➽ How to do Compatibility Testing for stand Alone Applications? ⇛ Here we test The functionality of the software on Multiple Operating System.